I love just dipping my corn bread in a good avocado oil or olive oil warm from the oven, or slicing fresh with a plateful of scrambled eggs and some jalapeños. However you like your corn bread - enjoy! Pre-heat oven to hot (180 degrees celsius). Grease a 20cm x 20cm cake tin or oven proof dish with butter. When corn bread mixture is ready to bake, place greased tin in oven for a minute or two so it is very hot when the mixture is added. Sift together flour, baking powder, sugar and salt, stir in maize meal. In a separate bowl beat egg then beat in melted butter and milk. Pour liquid into dry ingredients. Mix with a few rapid strokes. 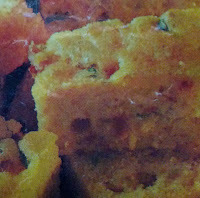 Over beating will prevent proper rising and spoil the texture of the corn bread. Place mixture in pre-heated tin and bake in hot oven for 25 minutes. Serve hot cut into squares or fingers. Corn bread is best eaten when freshly baked, but it may be reheated by quickly frying in butter to crisp the outside crust.